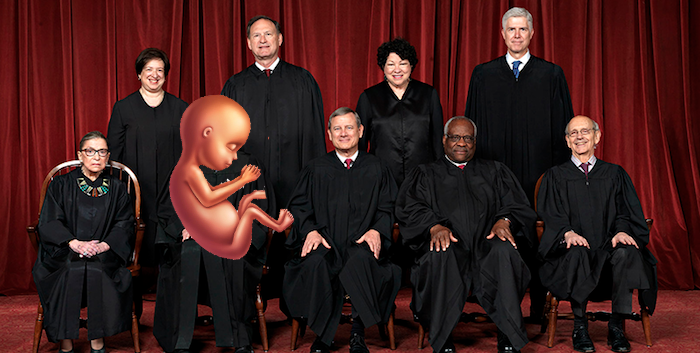 President Trump announced his choice to replace retiring Justice Anthony Kennedy: a twelve-week-old fetus. By nominating the fetus, Mr. Trump opted to look beyond his publicized list of potential nominees and made a choice that will shape the Supreme Court for the next 78.8 years, on average. Mr. Trump’s decision raised some eyebrows in the legal world, as the nominee has no eyebrows of its own. The Constitution does not mandate any qualifications for Supreme Court justices, but previous presidents have traditionally nominated adult humans. Alarmed that the fetus could join a solid majority to overturn Roe v. Wade, liberal activists launched a pressure campaign targeting the handful of moderate Democrats and pro-choice Republicans who could cast the deciding votes in the Senate. Senator Susan Collins of Maine, who previously declared that she would not vote for a nominee hostile to Roe, gave no indication of whether she would support the fetus. “We should always stake out an awkward middle ground with respect to fundamental rights that affect everyone’s lives,” she said. Collins said she is “looking forward to discussing our respect for established decisions, established law” with the nominee, which is three inches long and inside a woman’s uterus. “I’ll probably fall in line pretty easily on this one,” she added. At press time, Justice Ruth Bader Ginsburg was doing sit-ups.